attention | What is Psychology? Consider the card posted above. 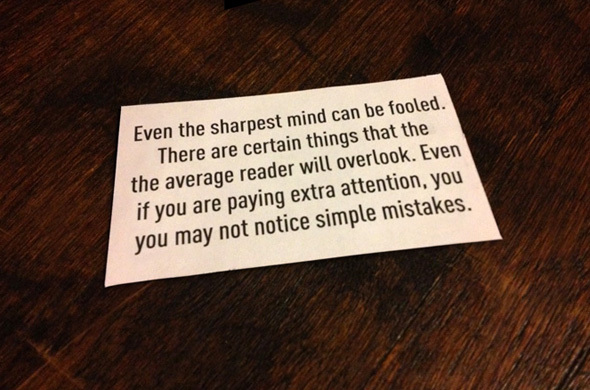 Do you perceive any mistakes? This entry was posted in Cognitive Psychology, Fun Facts And Optical Illusions and tagged attention, awareness, cognitive illusion, perception, psychology illusion, reading illusion, visual illusion on August 2, 2013 by WIP. Norberto Jansenson challenges our minds and our perceptive skills with his latest illusion. Can you account for the three missing cubes in the video above? Feel free to leave your comments below. This entry was posted in Cognitive Psychology, Fun Facts And Optical Illusions, Videos and tagged attention, awareness, missing cubes, missing cubes optical illusion, Norberto Jansenson, perception, psychology illusion on April 10, 2013 by WIP. 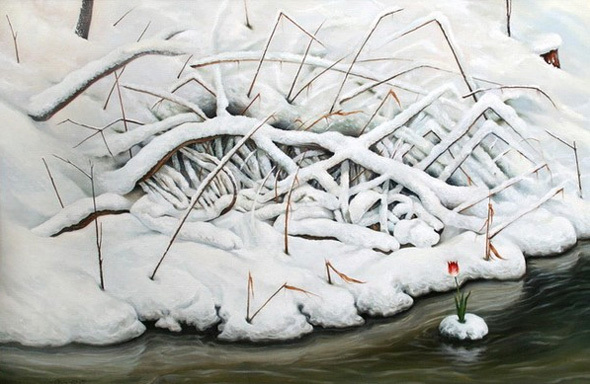 Another interesting piece of artwork by Igor Lysenko that embraces his usual “hidden motif.” Can you perceive anything hidden in the snowy bank above? This entry was posted in Cognitive Psychology, Fun Facts And Optical Illusions and tagged attention, awareness, cognition, Igor Lysenko, optical illusion, perception, psychology illusion on April 5, 2013 by WIP. This entry was posted in Cognitive Psychology, Fun Facts And Optical Illusions and tagged attention, awareness, cognition, illusion dance, optical illusion dance, perception, visual illusion on April 1, 2013 by WIP. Can you decipher the mysterious blotches in the image above? Leave your response in the comment section below! 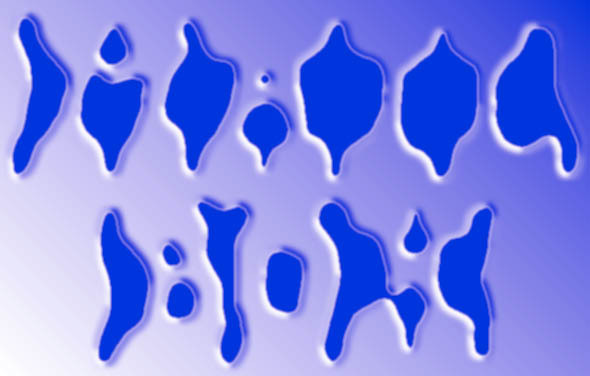 This entry was posted in Cognitive Psychology, Fun Facts And Optical Illusions and tagged attention, awareness, blotches illusion, cognition, optical illusion, perception, visual illusion on March 28, 2013 by WIP. Most persons see a tiger in the image above, but the more perceptive among us might just be able to see something else. If you’d like a hint as to what is hidden in this image, then please have a look at the Craig Tracy Leopard Illusion. 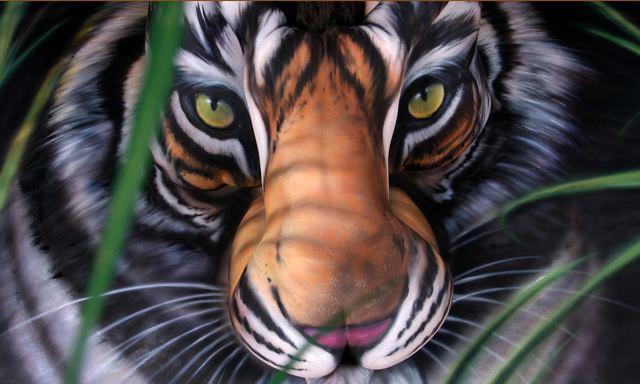 This entry was posted in Cognitive Psychology, Fun Facts And Optical Illusions and tagged attention, awareness, Craig Tracy, optical illusion, perception, psychology illusion, tiger illusion, visual illusion on March 19, 2013 by WIP.